It took me forever to write a blog post. I'm not lazy, nor am I running out of idea. I have plenty waiting for me to write up. But narrating needs the right ambiance, the right feel and the time to do it for a fussy-pot like me. Dim sum sized egg tarts are always known to be flaky and cute but not when you only have limited moulds. I've only got 6 mini moulds and it took me 2 rounds to finish baking it. In fact, I yield more than the recipe mentioned. The key is to sieve it twice and try not to create any bubbles within the filling. After chilling the dough for 20mins in the fridge so it is easier to work with. Wrap dough A with dough B. Dough A is the larger yellowish one. Here, I made slight variation to the original recipe. I once read somewhere that Dough A is formed into a ball and then an 'X' pattern is pressed on it and Dough A is then rolled out to obtain the pattern as above. Dough B should be shaped to roughly form a square. Pinch to seal each and every corner so that only Dough A is visibly by naked eyes and that Dough B is fully hidden within Dough A. With the aid of the rolling pin, firmly press down all over the surface of the dough, taking care not to leak any Dough B out from Dough A. 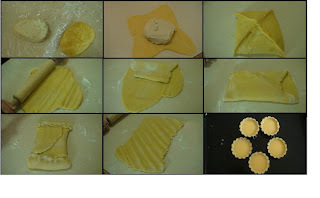 Fold dough 3 times (make 2 folds like an envelope) and pinch to seal and form back into a rough rectangle shape again. With aid of the rolling pin again, press out the dough to get an even rectangle shape. Not shown in picture: make another one fold, pinch to seal and press out with rolling pin and that's it! Chill the dough for 30mins in the fridge and roll out the dough to 1/4 inches thick. Here, I did not bother to chill the dough again for 20mins as Australia weather was pretty cooling on the particular day I was making the egg tarts. Put the egg tarts into the oven and turn the oven temperature down to 200°C. Bake for 10 minutes. Turn the oven temperature down to 180°C and bake a further 10 minutes, or until golden brown. The steps are the same as mentioned. But I did not beat the eggs in the filling as called for. I stir it lightly with a chopstick and pass it through a strainer twice. I then leave it aside until needed. The water-sugar syrup must also be left to cool before mixing with egg, milk and rum as the hot syrup might cook the egg. Then you'll get scrambled egg and won't get a yellowy filling! I roll the skin as what I've showed in the picture. I've seen this way of rolling somewhere and it indeed produces a thousand layer more quickly. Always remember to dust your table top . The SKIN B tends to be very sticky. What I do is, I mix it with my hand in a bowl until it is well mixed. Then, I scrapped off leftovers stuck on my hand with a plastic spatula onto a large square cling film and pour the rest of them from the bowl onto the cling film. I then simply wrap it up and sorta from a square and leave it in the fridge to chill. That's about it and I hope this information helps. Happy trying and Enjoy Baking! 32 comments on "Flaky Egg Tart"
I am going to save this and try making them. You really should try this! Very very yummy! Thanks for visiting and welcome to the blog! I really love how your egg tarts look like! I tried looking at the recipe for this egg tart but it seems like it's going to be serve to a lot of people. Could you please email me the amount of each ingredient to me? Already sent an email explaining things. Hope this helps. First of, I would like to thank you so much for sharing this. I love these, and I've been looking for a long time in how to make these but could not find a recipe that would teach how to make them like those in dimsum. So I'm just wondering if you would also send me the recipe. My email is akachantoboku3@yahoo.com. Thank you so much! Already sent you the recipe accordingly. I would advise you make a large batch of the skin and freeze it like what I do so you can have flaky egg tarts whenever you have cravings. You're welcome Jeanne and I really hope you enjoy the recipe I sent you. cheers! looks like a great recipe, been searching for the flaky dough, can you send me the recipe to green9806@hotmail.com...thank you! Already sent to your email! Thank you for having this website and for sharing your love for baking! I have been looking for a good recipe for the egg tart. Would you please send me the recipe with the amount for each ingredient? My e-mail address is brendaslee@yahoo.com. Just sent it to your email! mmm looks absolutely delicious. i'm dying to make them at home. can you send me the recipe? Can you send this recipe to me as well. I really like this. sry im a bit confused. u mentioned wrap dough A with dough B. does it means tt dough B is the one being wrapped inside? and dough A is the outer side? Dough B is inside dough A.
I tried making the egg tarts but the tart base was a little tough to bite through (i.e. it wasn't crumbly or flaky) and it was soggy... Would you know how I can rectify this? If you did not substitute anything at all for the pastry ingredients, roll it out exactly as I did, you will get a flaky and crumbly pastry. Did your Dough A and Dough B got mixed together or leaked out when you roll? You have to be gentle. Chill them if you think you handle them too much. It's the layering that gives them the flakiness. If you have done all that, the only reason I could think of is that you have over baked your pastry in the oven. How does the filling look like when you remove it from the oven? Did it balloon up or was it smooth and still a little wobbly? Don't give up and try again, after all, this one only makes 12. Once you have success, you will make more. Hi Quinn! I found your blog today when I Google's "flaky egg tart." I would really like to try this but....I don't really like to use shortening. I can substitute that for butter and still get a flakey crust right? Before I found your blog I liked to use puff pastry sheets, but they're not dense enough for me and a bit hard to control to keep a good shape. Great blog! Thanks for checking me out! You can use lard in place, I really wouldn't recommend butter if you want a very flaky and obvious layer tart. If you use puff pastry, make sure you get the good and expensive ones that says 'all butter puff pastry' because they are way way more top notch in quality! Try lard and butter as your last resort. Thank you for the recipe. Can I omit custard powder. I do not have it. What is the purpose of using it? Jintana, you can substitute it with cornflour if you like. Do not omit. I do not know why it is there for but baking is about science and not like cooking. Omitting it will yield different texture, I'm pretty sure. Hi your recipe is interesting,I was just wondering if using oil/butter instead of lard or shortening helps. Anonymous: Lard/shortening would yield a way flakier pastry crust compared to oil/butter but substituting it would be fine still. 60g shortening (approximately 4 tbsp and here and again, I use lard)"
Are you saying.. instead of using margarine or shortening, you used lard? Or did you add lard to the margarine and shortening? Instead of using margarine or shortening,I used lard. Is that the more we fold mixture of A and B the more layers we could get?? ji_ji: I'm glad you like the recipe, I hope it is or would be a success for you considering the success rate for this according to comments here are pretty average, though I've done it many many times without fail! And yes, the more you fold it, the more layer you get. Be careful though because butter/lard might leak through layers and you need to chill often. When fat leaks, layers are sort of destroyed. Will not affect taste, just texture. Anonymous: I really unfortunately could not find the time to do a video at this stage but nevertheless, great suggestion, always easier but I hope the step-by-step pictures sort of speaks for itself. I was searching everywhere for a flakey pastry egg tart recipe and none of the recipes were detailed enough, however I have to thank you so much for this recipe! I am surprised no one commented about how theirs turned out! I tried your recipe today and it was absolutely amazing! The pastry was exactly like bakery and dim sums! However I think the filling may need some altering. The taste is great but I can't make it look as nice as yours. My filling starts to turn a little brown at the top. I could show you how mine turned out. I even lowered the oven setting but then that leads to pastry not crusty enough. If i could figure out how to get the filling to stop turning brown then this would be great! Do you know how i could stop my filling from looking like it will explode in the oven? Again thanks a lot for this recipe! I made it today and everyone enjoyed it! Anonymous: If you roll the pastry thin enough, the pastry will brown nicely with a just firm wobbly custard and should not turn brown. the filling explode and bubble up because temperature is too high, something you would want with Portuguese egg tart, not this sort of flaky egg tarts.